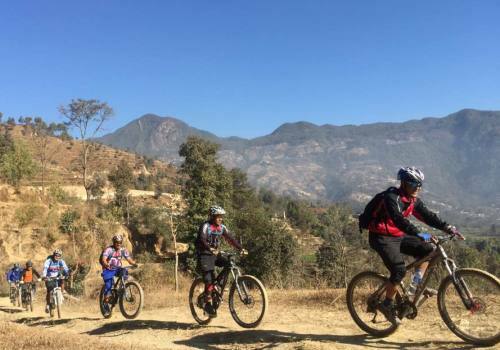 Mountain Biking in the Manaslu Circuit is not for everyone, but it also offers a unique experience for pure adventure seekers, a chance to get right off the beaten track and ride were very few riders have ridden before. This region offers some of the most unbelievable trails for technically skilled riders who are willing to push and carry for the rewards. 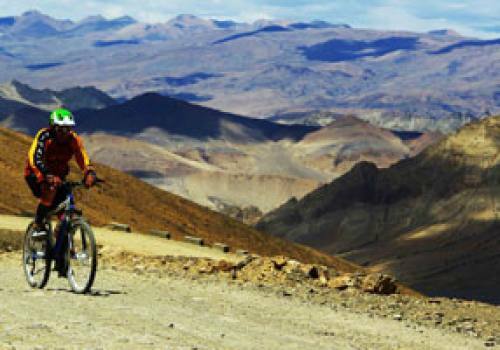 You have to carry your bike 50% of the time, but when you lay tread on dirt amidst some of the tallest mountains in the world you will revel in the fact that it is just your wit, skill and stamina against this encompassing environment. 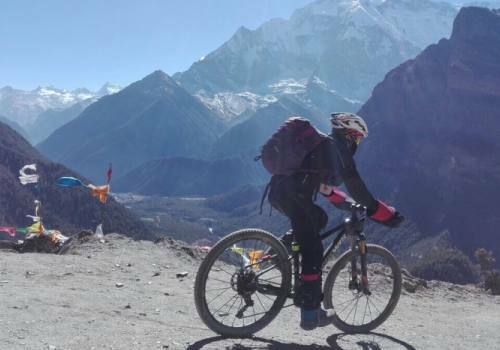 Manaslu is the trail of the future for mountain bikers in Nepal and we where overwhelmed by the sheer joy and surprise of the local people who welcomed us as the first cyclists into the area with pure bewilderment. So go there and discover the rich culture and hospitality of the hardy mountain people and push your limits beyond anything you ever imagined on this unforgettable journey. 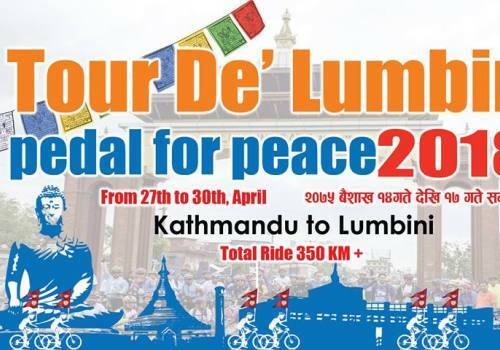 Day 02:Kathmandu to Arughat Load up the mountain bikes and drive to Arughat which takes around 7 hours with beautiful scenery along the way as you cut through the foothills of the Himalaya and into the heart of Dhading District. We ride 20 mins to the hotel. Take some time to explore the beautiful Newar village of Arughat. Overnight at hotel. 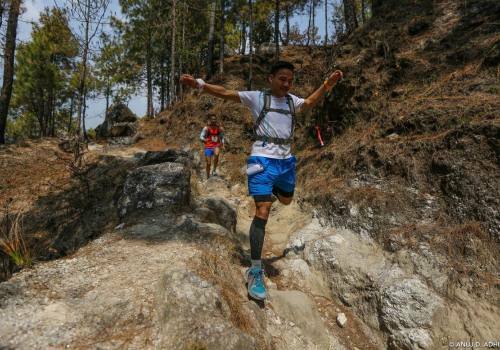 Day 03:Arughat to Machha Khola Mixed trails of single track and jeep track which is 60% ridebale take us along the ridge above the Buri Gandaki River. The ride is about 25km mostly flat with some small ups and downs. Overnight at night. Day 04:Machha Khola to Jagat A solid five hours of technical trail today sees us cross the Machha Khola and follow its banks upwards to a hot springs at Tatopani. We climb steadily along the river, 50% of this trail is rideable and there are some tough carry sections. At Jagat, there is a police check-post where your trekking permit will be checked. The trail is a little bit scary, very narrow single track with a big cliff drop and we need to be careful as the trail is heavily used by donkeys. Overnight at hotel. Day 05:Jagat to Lakuwa We progress gently uphill and again cross the Budi Gandaki River as we head towards Philim and on to Lakuwa. 45% of today’s trail is rideable. Along the way there are some beautiful views of Ganesh Himal and the river. The town its self is small and beautiful. Overnight at hotel. Day 06:Lakuwa to Chhokkung Today there is some super single tracks as we enter into the Upper Tsum Valley. From the valley, the Ganesh Himal range can be seen directly to the south where it provides spectacular views of the Baudha and Himal Chuli peaks to the southwest. The day long with large altitude gain and some sections of carrying the bike. Overnight at hotel. Day 07:Chhokkung to Mu Gumba Mu Gumba is the largest monastery in the region and is located at the highest and farthest point in the Tsum valley. It takes us three hours to ride up and two hours back down. A beautiful day of nice trails and scenery and 855 rideable. We can also see Yak Caravans heading into Tibet. This Valley is like being in a different world, a flat bowl in the middle of the mountains, a magical place. Overnight at hotel. Day 08:Chhokkung to Dyang A really great day of riding with 80% rideable single tracks and lots of downhill with a few scary cliffs. 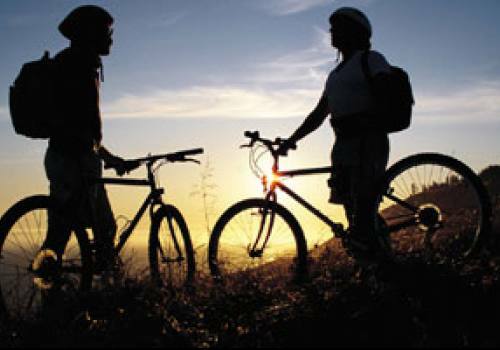 This is one day you will really enjoy and one of the best days riding on the trail through old growth Pine Forests. Overnight st hotel. Day 09:Dyang to Namrung Ride from Dyang to Namrung takes about five hours to six hours. 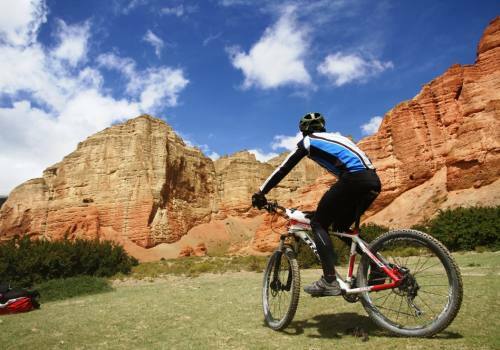 In the beginning, you ride an almost flat path and then the trail moves uphill all the way to Namrung through forest. In this trial 50% is rideable and lot of carrying section to Namrung. overnight in camp. Day 10:Namrung to Shama Gaun Uphill some section very nice riding ,very good scenery. Namrung to Samagaon takes about four hours. You follow the right bank of the river, with views of Peak 29 ahead. 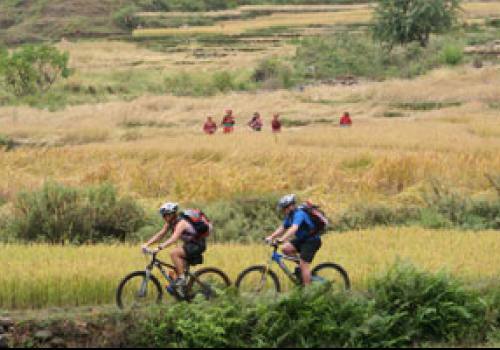 As you continue on the main trail you soon reach the barley fields of Sama Gaon. You see excellent views of Samdo (Pang Phuchuli); Nagdi chuli, Simnang Himal, Manaslu glacier, Manaslu ice fall and you can see Birendra Kunda is an ice lake nearby the Manaslu Base Camp. Overnight at hotel. Day 11:Shama Gaun to Samdo Two hours of mostly flat riding and a lot of carrying allows us to acclimatize to the altitude, a quite short day. Day 12:Samdo to Dharmasala Another short acclimatization day of riding and 80% of carrying as we climb higher into the mountain on the shoulders of Manaslu. Overnight at hotel. Day 13:Dharmasala to Bhimtang Early in the morning you begin to trek up and carry a steep ascent to Larkya La. From here, you can enjoy the views of Larkya peak, Mt. 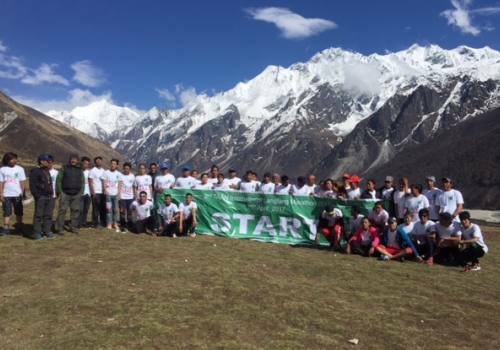 Manaslu, Ratna chuli, Cheo Himal and many other snow capped mountains and peaks. Crossing this pass, you follow a steep downhill path through rock and ice. On the way, you will encounter many ice lakes. Bimthang is a broad and level valley with a number of Mani walls and deserted houses. Overnight at hotel. 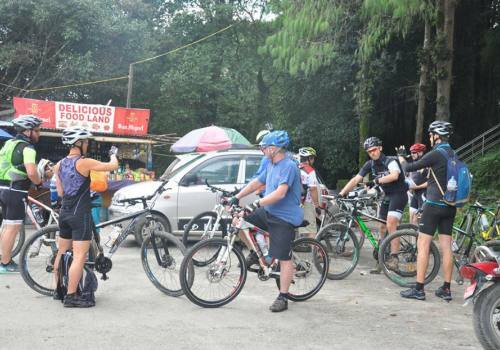 Day 14:Bhimtang to Dharapani An awesome and well rewarded day with 80% rideable and downhill single tracks. You will love this day as we re-join the main Annapurna trail at Dharapani. Today is about 6 to 7 hours of brilliant riding. Overnight at hotel. Day 15:Dharapani to Besishar and Transfer Back to Kathmandu 45km of fun downhill riding on rugged jeep tracks as we ride along the Marysandi River to the transport hub at Besishar. From here we transfer back to Kathmandu by Jeep. Overnight at hotel. Day 16:Departure Our Airport Representative will drop you at the international airport in Kathmandu for your flight departure from Nepal. 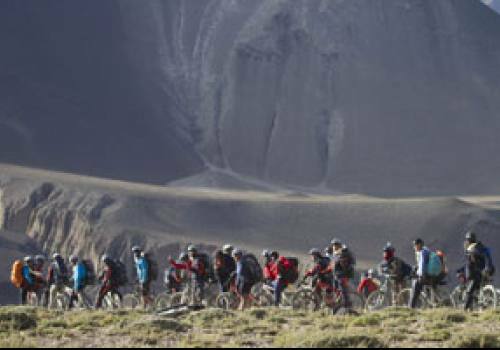 Down Hill Tours to Nepal.